This another way of referring to the top section of your hair, a U-shaped section that starts around the corners of your forehead. If a stylist is going to do a partial weave, this often refers to weaving only the mowhawk section. The outside layer of a strand of hair. A stylist will often refer to the condition of the cuticle to determine how healthy the hair is, or how well it will respond to the hair color. Hair porosity refers to the cuticle's ability to absorb moisture. Hair that is damaged is generally very porous and will soak up everything that is put on it because it needs moisture. This is why coloring damaged hair can be difficult. If it's porous, it can soak up the color and turn out darker than anticipated, or in some cases, the cuticle is so open that the color won't stick and it will turn out too light. If you want to make a drastic change to your hair color, I recommend getting it in good condition before you do. Roots-hair closest to your scalp. Ends-the ends of your hair. Mid-shafts-everything in between. The level of your hair refers to how light or dark it is. All hair color lines are different, but most are on a number system - level 1 being black and level 11 being platinum blonde, plus every shade in between. This is helpful to know in a color consultation if you plan to go lighter or darker. How your hair "pulls" is another way of saying how well it responds or takes to the hair color. Based on your hair texture and condition, every hair type takes hair color differently. Some hair always pulls ashy, some hair pulls warm, and some hair pulls true to the color swatch. Going from a darker shade to a lighter shade. A general rule of thumb is that if you have colored hair, if you put a lighter color on top of it, it won't do anything. Hair color won't lift hair color to a lighter level. The majority of the time you can only go lighter with bleach or color remover. This isn't as scary as it sounds. If you do it gradually and if your stylist is careful, your hair will be fine. Going from a lighter shade to a darker shade. When you color hair darker, you are "depositing" color into the hair shaft. A color filler is something you may have to get if you are a blonde wanting to go dark. I'm sure you've seen blondes who decide to go dark, but it just ends up looking muddy, almost greyish, rather than rich and pretty. This is what happens when you go from blonde to dark without a color filler. A color filler is when you add extra warmth to your color formula that is missing in blonde hair, but needed to make dark hair look rich and vibrant. A lot of stylists like to do two separate color services - the color filler followed by the dark color. 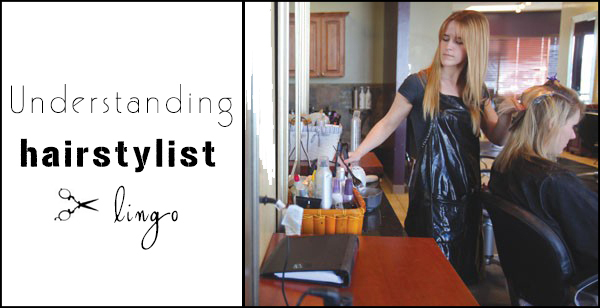 Other stylists mix the added warm colors into their original formula so they only have to color the hair once. Either way works. The razor is an alternate method of cutting hair to the scissors. It is basically just cutting the hair with a straight razor. Razor cuts are less blunt than scissor cuts. Razors are often used for thinning and texturizing because they remove extra hair without creating blunt lines. Depending on your hair type, the razor can cause your hair to frizz. This is most common on those with curly or coarse hair. Rather than cutting in a straight line, point cutting is when you cut vertically into the ends of the hair. This is done to soften blunt edges or remove excess weight. Texturizing is removing extra hair to add texture to your haircut. This can be done by point cutting, with the razor or with texturizing sheers. Texturizing helps with volume, removes excess weight and helps your haircut lay better.